By Nicholas Cunningham - posted Tuesday, 22 May 2018 Sign Up for free e-mail updates! In the IEA's May Oil Market Report, the agency said that OPEC might be needed to step in and fill the supply gap if a significant portion of Iran oil goes offline. Saudi Arabia suggested shortly after the U.S. announced its withdrawal from the Iran nuclear deal that OPEC would act to mitigate any supply shortfall should it occur. But while geopolitical fears helped push Brent up to $79 per barrel in recent days, the underlying fundamentals are also mostly bullish. Venezuela's production is plummeting, and output is 550,000 bpd below it's agreed upon target as part of the OPEC deal. Conservative estimates suggest that the country could lose several hundred thousand barrels per day over the course of 2018, but there are several massive threats to PDVSA's operations that could make that forecast look optimistic. ConocoPhillips continues aggressive action to obtain control of PDVSA's assets after an international arbitration court awarded it $2 billion in awards. There is a great deal of confusion about what Conoco's actions mean for Venezuela's oil production, but the asset seizures could be pivotal. Reuters reports that the American oil major is now trying to seize two cargoes of crude and fuel near a terminal in Aruba run by Citgo, a subsidiary of PDVSA. The cargoes are holding 500,000 barrels of oil and 300,000 bpd of jet fuel, gasoline and diesel. On top of that, Venezuela is set to hold a presidential election on May 20, an event that could be met with more painful U.S. sanctions. Conoco's actions, combined with a crackdown by the U.S. Treasury, could send Venezuela's oil production deeper into a death spiral. The big question is if supply will be lost in Iran, which, coupled with the supply losses in Venezuela, could severely tighten the oil market. "The potential double supply shortfall represented by Iran and Venezuela could present a major challenge for producers to fend off sharp price rises and fill the gap, not just in terms of the number of barrels but also in terms of oil quality," the IEA wrote in its report. 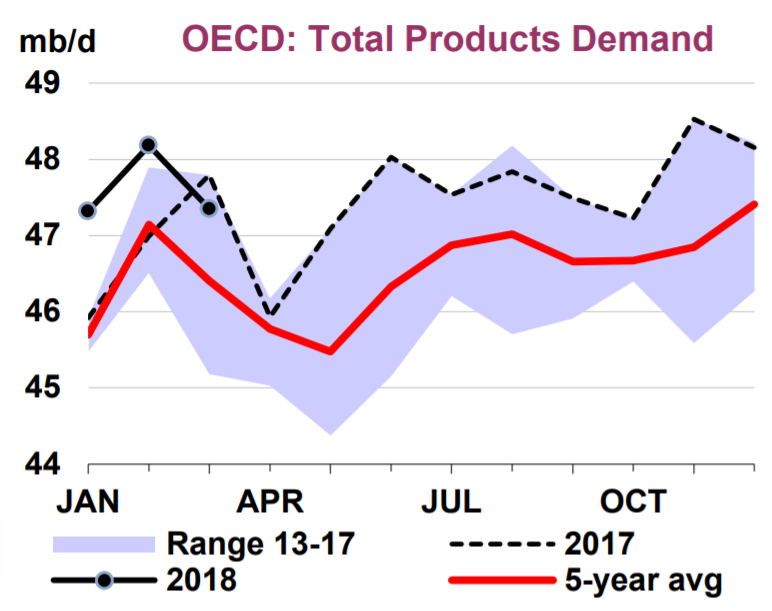 OECD crude inventories fell in March by 27 million barrels, putting total stocks at a three-year low and, crucially, 1 million barrels below the five-year average. That data point is worth emphasizing: OPEC has claimed for more than a year that it was trying to erase the inventory surplus, and at least according to IEA data, that mission has now been accomplished. Still, the group may not be ready to take their foot off of the accelerator. They meet in a few weeks in Vienna to figure out their next steps. But with inventories now back at average levels, there is some upward pressure on oil prices, particularly with more outages looming in 2018. However, the cure for higher oil prices tends to be higher oil prices. The IEA lowered its demand forecast for 2018 by 40,000 bpd – not a massive revision, but notable because it offers some signs that demand will slow as prices rise. Some other reports back up this notion. There are reportedly spot cargoes for oil from West Africa, Russia and Kazakhstan that are going unsold, forcing steep discounts. "While recent data continue to point to very strong demand in 1Q18 and the start of 2Q18, we expect a slowdown in growth in 2H18." Up until now, demand growth looked strong, but "the recent jump in oil prices will take its toll." "On balance, the report is tending more to the negative side. Demand for oil has been revised downwards for the second half of the year from April," PVM Oil Associates strategist Tamas Varga told Reuters. The IEA noted that the global economy is still "doing well," and that "underlying demand growth remains strong around the world." That suggests demand won't suddenly fall off of a cliff. "Still, the fact is that crude oil prices have risen by nearly 75% since June 2017," the agency cautioned. "It would be extraordinary if such a large jump did not affect demand growth, especially as end-user subsidies have been reduced or cut in several emerging economies in recent years."